Because of many reasons that I didn’t cook Seafood for ages. So, when my mates stopped by for lunch last week, I managed to cook something that they do like. 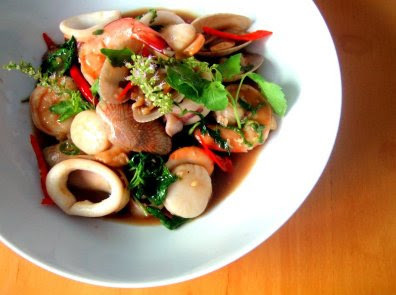 "Seafood cooked with Holy Basil Leaves" came to mind. Then I served it with “Ink Squid Pasta”, my mates loved it too bits. 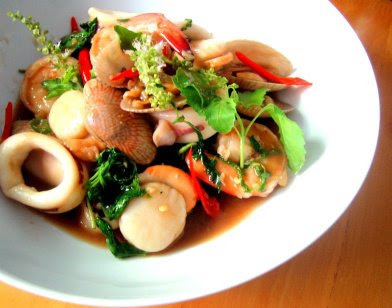 "Phad Ka-Pao" is the most popular & the most beloved "stir-fry" by Thai poeple. It's versatile - you can cook it with Meat, Pork, Chicken, Tofu or Seafood. Oh well, it can be cooked with anything, really. Anyway, this dish is where Calories & Cholesterol meet up. Personally, I eat "Seafood" in moderation – 2 times a week not more than that. I can't pronounce it but man it sure looks good! Nice photography BTW. Cholesterol in prawns and other seafood has little effect on the cholesterol levels in your body. To reduce your cholesterol level, it's much more important to avoid eating food high in saturated fats. There's no need to avoid seafood.